Eat Well Embrace Life Other Bean Hummus - Hold. Everything. This is the best hummus on the planet! When they say "Other Bean," the peeps at EWEL mean lentils, edamame, black beans, white beans... No chickpeas in sight. Even people who think they don't like hummus will love this stuff! The Zesty Sriracha Carrot flavor is insanely amazing, as is the Beet version. And each 2-tbsp. serving has just 40 - 60 calories, 2 - 4.5g fat, 95 - 125mg sodium, 3 - 5g carbs, 1 - 2g fiber, 0 - 2g sugars, and 2g protein (PointsPlus® value 1 - 2*). Click to find ASAP. Skinny Cow Creamy Iced Coffee Drinks - Sweet iced coffee with minimal effort and impressive stats? Nope, we're not dreaming. (If we were, Channing Tatum would be making the coffee for us.) The new single-serving bottles come in Vanilla Latte, Creamy Cappuccino, and Mocha Latte; each has 120 calories, 2.5g fat, 150 - 200mg sodium, 20g carbs, 0 - <1g fiber, 18g sugars, and 5g protein (PointsPlus® value 3*). Yum! Now at Target, and coming soon to more retailers. 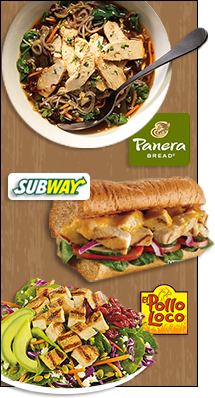 Panera Gets Steamy with Broth Bowls: One more reason to love Panera Bread... These brand-new bowls feature soy-miso broth with additions like chicken, quinoa, lentils, kale, and edamame; each one has 370 - 410 calories and 9 - 13g fat (PointsPlus® value 10 - 11*). Mmmmm! Also new? The Power Almond Quinoa Oatmeal, with 290 calories and 6g fat (PointsPlus® value 7*). Go, Panera! Subway Skips Artificial Ingredients in Grilled Chicken: These new strips of white-meat chicken have no artificial preservatives or flavors... just lean meat, lightly seasoned and grilled. They're featured on the new Monterey Chicken Melt, which has just 360 calories and 8g fat for a 6-inch sub (PointsPlus® value 9*). Woohoo! Is it lunchtime yet? 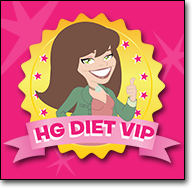 Wondering how the HG Diet VIPs, your new virtual weight-loss buddies, are doing on their journey? After just one week on the Hungry Girl Diet, the group is down an average of 4 pounds each! Elizabeth learned cake is a trigger food and avoided the temptation (with an assist from HG's Cannoli Bites, page 219 in the book! ), Eileen is full of energy and feels much better than before she started the diet, and Maria discovered it's possible to attend a dinner party without compromising her diet. Click to see their individual weight losses, and stay tuned for more... ***Hack attack! We never met a shortcut we didn't like -- this list of kitchen hacks from our partners at About.com Health is full of gems. Scoops, scales, and DIY snack packs, oh my! These tips are way in line with the HG philosophy... ***Nowadays, the Super Bowl is almost as much about wacky ads as it is about football. Well, avocados have a commercial of their own to debut this year, marking the first time an ad for fresh produce will be featured during the big game. Cue the HG guacamole recipe... ***And if you're food obsessed like us -- you're reading this, so you probably are -- you'll be interested to know what's next in the world of food gadgetry. At the top of our "Want" list: the Smart Grill (tell it what you're cooking, and it'll figure out the rest) and the Smart Refrigerator (which allows you to check the contents remotely from your smartphone or tablet). Wowzers. And that's all we've got. HG out! 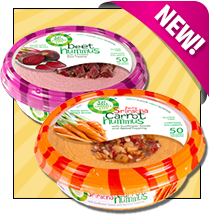 All-star hummus, guilt-free menu finds, and more... Click "Send to a Friend" to share the news while it's still new! Today is Martin Luther King, Jr. Day, January 19th. Head to your favorite movie theater to check out Selma in honor of Dr. King... But first check out our dining-out guides for your pre-movie meal!